~ How would you explain our society to a visiting alien? Neil deGrasse Tyson is not Bill Nye or Carl Sagan, but he is at least as effective in making science accessible and understandable to the general public. 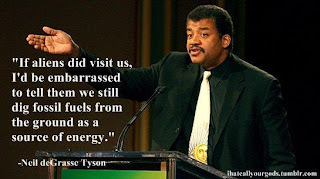 He's embarrassed by our addiction to fossil fuels. We should all be so, because it is an indication that our society is primitive. Why? Consider the anthropological arc of humanity. In pre-historic times our ancestors scavenged to meet their needs. If they could find what they needed to survive, great; if not, times could be tough, even fatal. There were good times and hard times, and chance played a dominant role. In time, they learned how to systematically hunt and gather food and the raw materials they used to make everything from tools to clothing to shelter. The element of luck was reduced through the application of intelligence and experience, but people still had to hope that they would find what they needed to survive. About 10,000 years ago humans started to settle in communities where they raised crops and domesticated animals. They went from being hunter/gatherers to farmers, and began to exert much more control over supplying themselves the necessities of life. This transition was from a more variable, hardscrabble and chancy existence to one that was more controlled, certain, and importantly, sustainable. But that's food, and perhaps shelter. Where on the scavenger-hunter/gatherer-farmer spectrum are we with energy? With fossil fuels we are at best hunter/gatherers. We pursue ever-more remote, costly and technologically challenging oil and gas deposits. We struggle with fracking, oil shale, and tar sands. We're certainly not practicing anything remotely as sustainable as growing crops or raising livestock. We scavenge the earth for dwindling deposits of fossils much like humans once hunted species to extinction. Instead, it is time to start farming; to grow energy right where we live using plentiful and available resources like wind, solar, geothermal and biomass. People needn't go far and possibly die in dangerous and desolate areas when we can provide for all of our needs as part of human settlements. With energy we are really little more than scavengers. It's primitive, and it's embarrassing.